Do you have feedback about Fatal Tide for the author? Send it here. “Well done & thank you. Your ability to deliver the story with every emotion I can think of. Having been in the race & so involved, it was easy to be captivated by your story telling. The science behind hypothermia was very interesting & the research was outstanding. Your accounts of the people involved had me consumed from the beginning. You have given an honest account of the events on that day & the trials & tribulations of the aftermath to the athletes & their families. My wife & I were so interested in the book that I read the complete contents to her out loud... it was a first for us... & we both laughed & cried. “I received my copy from Chapters last week and have been enjoying every minute of it. I still am only reading through the first half of the book but based on what I have read think that you have done a tremendous job. 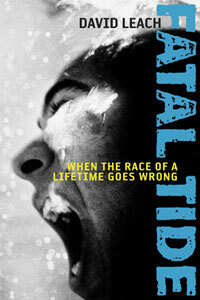 “I read Fatal Tide today. I found it to be a very interesting, informative and provocative book and I'm glad I read it. Based on my limited knowledge of all the facts concerning the Fundy Multi-Sport Race, I believe you've done an excellent job with your research. Everything that I knew about the event was accurately recounted in your book, and much more.